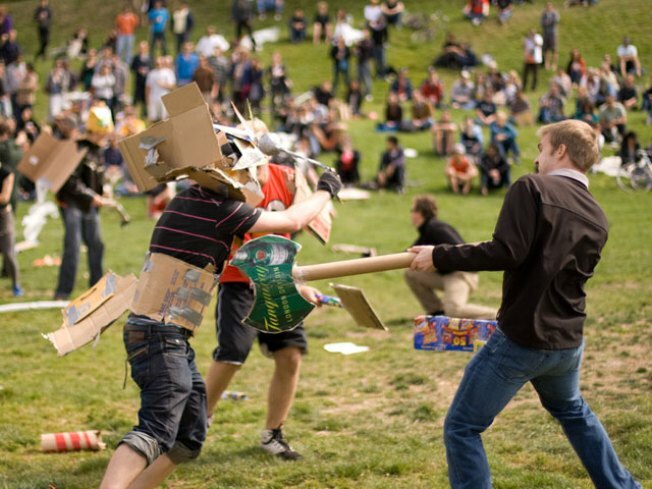 Box wars at Dolores Park would have had a different feel with a Burger King in the background. If Blue Bottle running a coffee kiosk in San Francisco's Dolores Park was a problem for neighbors, they are not going to be happy about who the City was really going after. San Francisco's Recreation and Park Department has been trying to come up with creative ways to generate revenue to offset the hunger pains induced by the struggling economy. The cash-strapped department had the idea of capitalizing on the popularity of street food in the City and issue licenses to local businesses to legally operate in the department's park. One plan was to move Oakland-based coffee roaster Blue Bottle into the park but ultimately the vendor pulled out of the deal because of public outrage. But some interesting reporting from Uptown Almanac, obtained through a Sunshine Ordinance, shows the City wasn't putting local businesses first on its priority list. The department contacted 910 companies about possibly operating in city parks and of them only a few were local businesses at all. Instead the City actually reached out to the likes of Auntie Annes Pretzels, Ben & Jerry’s, Burger King, Fuddruckers, Haagen Dazs, Jamba Juice, Nestle Café, Orange Julius, Peet's Coffee & Tea, Pizza Hut, Subway, TCBY, The Cheescake Factory, Walt Disney, Wendy’s, and World Wrapps, just to name a few. However, the idea probably would not have gone over well with the Board of Supervisors, who publicly expressed their concerns about McDonald's sponsoring an ice rink near city hall.